The latest, goofiest, likely mispelliest headline from CogDogBlog. Just what the world needs. 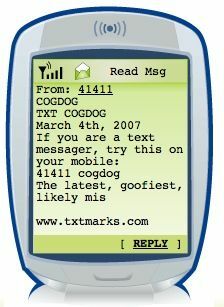 This was created with TextMarks, a free service where you can set up a keyword so when someone TXTs it will get back either fixed response, or as I have set it up, text from any web page (we;; 125 chars of it). I think you can also message the service from your phone so you change the response. So while this post is top of the heap, you will get something like the image to the right. I can really not think of an actual use yet, as I did this solely to see how it works. Other available textmarks include getting movie ratings from IMDB, translate English to Spanish, the location of someone’s yacht, Work Schedule for Richard Herman Walker, and hundreds more. The point is not that any of these are profound examples, but just a quick scan of what exists there. This could be an easy way for a teacher to provide status of assignments, for project participants to do updates, to generate a random user tip, too… maybe you tell me. Maybe it is just a gimmick (reading pased allt he site’s statements on “monteizing” a verb I will never use without quotes). This is a US-specific thing I’m guessing, no? Yes, sorry. But then again, our systems, phones, networks are several years behind Europe and Asia. I used it for the first time today and think it may work well. I’ve posted HW assignments for the kids to see. Give it a try. Send MrKeatley to 41411 and check out the assignments. Now they can get HW wherever they are, no excuses.